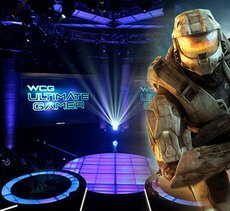 Video game players and reality TV show fans may rarely seem to cross over, but the Syfy cable channel brought the two groups together with the WCG Ultimate Gamer series. This reality TV series put twelve gamers into a single loft and provided them with regular challenges. Each of these challenges resulted in one ultimate loser who was eliminated from the game. The premise of the series was very similar to the Big Brother reality TV show. Every episode would involve both a Real Life Challenge and an Isolation Challenge. All of the contestants in the loft would compete in the episode's Real Life Challenge. This could be something like playing paintball or completing an obstacle course. Each of these challenges gave the players a clue about the video game that would be played in the Isolation Challenge. For example, the paintball challenge led into playing Halo 3. A guest judge, usually a celebrity with some connection to the challenge, sometimes appeared in this part of the show and had the final say in these challenges. The winner or winning team also often got some sort of prize. Following this challenge, players would then be sent to their individual rooms to play a game on the Xbox 360. This Isolation Challenge had only one winner. Whoever ended up with the highest combined score from both challenges would then select a gamer to play against whoever had the lowest combined score. The loser in this Elimination Challenge then had to leave the loft. In season 1, the winner could elect to play against the lowest scoring player themselves, but that rule was changed in season 2. Season 1 of the show began on March 10, 2009, and ended on April 28, 2009. It was made up of eight episodes and featured 12 contestants. The final winner of the season was Mark "applesauce" Smith, a gamer who had played for several league teams. He defeated Robert "Prod1gy X" Paz in the final episode to take the title. Season 2 started on August 19, 2010 and ended on October 7, 2010. It also ran eight episodes and featured 12 players. 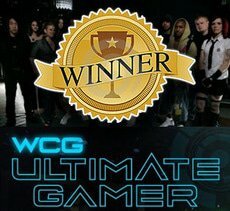 Katherine "||| Mystick |||" won the title of WCG Ultimate Gamer in the final episode after beating Yazan "yaz the clowN" Ammari. The series was sponsored by Samsung and by World Cyber Games (WCG), a company based out of Korean that hosts a number of international e-sports events. It was hosted by Canadian actress/model Hannah Simone with Joel Gourdin co-hosting.